I had a very early start in Sydney, catching the 07:11 to Casino. Yes, that’s right: only as far as Casino (an 11 hour train ride), and then it would be a bus for a further 90 minutes. I was sad to leave Sydney, and my lovely friend Pete, but I guess a big part of this adventure is seeing new things and travelling to different places. I was in such a rush to get the train, I didn’t stop for a cappuccino or breakfast – a decision I was to regret later. So, the train: quite old-fashioned, really, and a bit quaint. All the seating was airline-style, so the first bit of my plan was scuppered – I thought I’d be able to work at a table, getting some writing done while I admired the scenery, and feeling generally inspired. Never mind, I thought, I’ll do some writing at my tiny little airline table. But no, the train ride was definitely not conducive to handwriting – this was not a smooth rail track. Well, my next idea was to do some work online via my trusty iPad – emails, reading some documents I’d been meaning to catch up with, maybe write a blog post – but flipping heck, no wifi connection!! I was beginning to think I’d travelled back in time a few years! At least the train itself was comfortable: the seats were reclining (these journeys are long…), and there were cute little fold down footrests. Happily, I had some papers with me, so I settled down to at least have a peaceful read of those. But at the very first station (and there were an awful lot of those along the 800km – no super fast railway system here), an elderly lady came and sat next to me (the seats are all pre-booked). I made the fatal error of mentioning the lovely weather, in true English fashion. That was it, she (Diane) was off: she was travelling all the way to Grafton (one stop before Casino), and she was intent on chatting all the way. That’s 10 HOURS. I thought I could talk, but honestly, she made me seem reticent. And the funniest thing was, she had that way of telling you about people (her large and complex family) and places (I developed a mental map of her life travels) as if you should somehow know them all. Yes, I sound mean. Yes, I’m probably going straight to Hell. But really, I had been sooooo looking forward to this peaceful day! Meanwhile, I was hugely enjoying the witty chat over the tannoy from the chief steward, in which he generally slated the food he was selling! There was a choice of hot meals, and when mine arrived I understood his feelings entirely. It was not good. But on the plus side, it only cost the equivalent of £4.50, so at least I didn’t feel like I’d paid for more than I received. These first world problems aside, the scenery really was stunning, and it was fascinating to watch the landscape change. And actually, to watch the passengers evolve – somewhere around Taree, we began to pick up lots of hippies and surfer dudes: dirty hair, guitars and tiny amps, backpacks, tie dye, hair braids, tattoos, killer tans, interesting aromas… You get the picture. Oh, and I saw kangaroos hopping around in the fields near the tracks, and nearly went into tourist meltdown! So anyone who’s friends with me on Facebook will know that I survived the flight and am now in Sydney. That sentence amazes me – Sydney!! More about that in my next post, but today I thought I’d just extol the virtues of self-hypnosis. On Wednesday, I made my way (very early in the morning) to Manchester airport, and noticed that I didn’t feel exactly terrified – at least, not to my normal level of pre-flight panic. After a fabulous amount of queuing and waiting, I finally made it onto the plane, and found myself with a window seat, just beside the wing. Normally, this would have been a terrible thing – seeing a plane wing and an engine is not the best way to induce calm in someone terrified of all the things that might go wrong! But this time, I felt okay about it. Take off was good (always happy to find that even big planes can make it into the air) and then it was drink/lunch time (at about 11am, for goodness’ sake – my poor body clock!). I managed not to keep one eye trained on the cabin crew, as I normally would, and I even watched some films! And I was taking pictures of the mountains somewhere over Iran/Iraq without any sense that I really shouldn’t be looking down there. Then it was feeding time again, followed by a landing in Abu Dhabi. Under usual circumstances, I’d be really, really hacked off at the thought of having to go in another plane, but again I was fine. Most amazingly, on the second part of the journey I managed to go to sleep!! By now, I was realising the amazing brilliance of that hypnosis app – honestly, ask anyone who’s had to endure a flight with me before, I was like a new woman this time. At the end of it all, as we made our exciting landing in Sydney, I even had the bizarre thought that I’d quite enjoyed the experience! Happily, I’ll have time to listen to the app plenty more before I have to get on another plane. 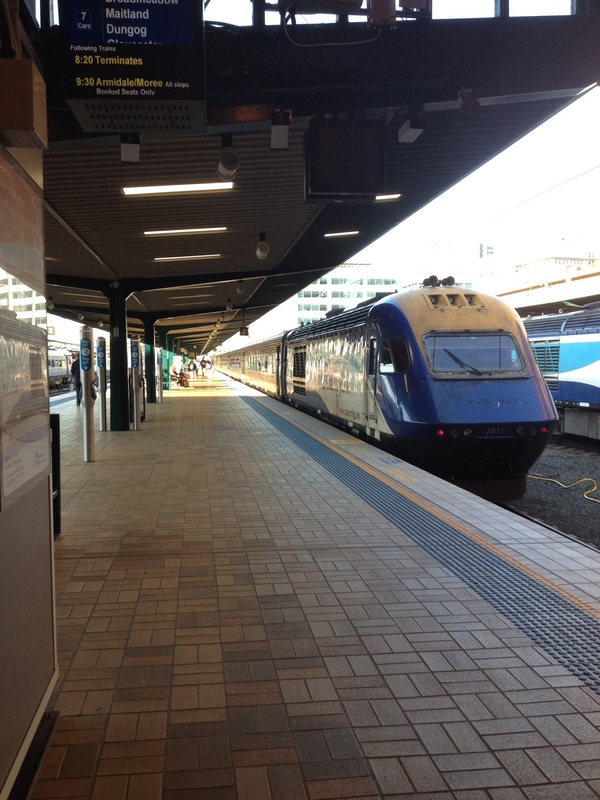 For now, it’s Sydney, and then the exciting train journey up to Byron Bay – no hypnosis app required for that one! I’ve realised that it’s less than six months until this epic journey happens. And it does feel like it’ll happen, now, because I’ve been talking about it to lots of friends – apparently I’m one of the last people in the world to visit Australia (or so it seems). Talking about things often makes them seem more real, I find. The downside of these conversations is the inevitable question: ‘But what about your massive fear of flying? !’ It’s been a long-standing joke, my aversion to getting on a plane, and I’ve been trying to deal with it for a lot of years. Back in the mists of time, when I was not a parent, I flew to Saudi Arabia a couple of times, to visit my Dad who was working there. I also flew to the Czech Republic, Greece and Paris. Bizarrely, I can’t remember being utterly terrified in those days – I mostly just enjoyed the food-in-a-tray excitement, and the biggest dread was about having that toddler playing peek-a-boo for THE ENTIRE JOURNEY over the seat in front. I do remember not particularly liking taking off or landing, but there was no gripping of the arm rest, or hawkishly watching the cabin crew’s faces to make sure I knew the minute something might be wrong. I know, I sound like a mad woman. Anyway, somewhere in the mire of having children, I developed a proper, full on fear of getting on a plane. I think it’s something about being a responsible grown up – several of my friends have been able to relate to this idea. So in 2010, I had to go to Belfast for a conference. Believe me, I looked at every possible way of travelling that didn’t involve planes – a combination of car and boat, or train and boat, or train, boat and car… But they all took too many days, and I decided I should face my fear. I heard Chris Moyles talking about how he’d used a self-hypnosis app to conquer his fear, and thought this sounded like something I could do to help myself. I have no idea whether the app worked – I never managed to stay awake long enough to even hear what was on it. I always woke up to a lovely, calming sound that told me it was over. I think I may be worryingly susceptible to hypnosis… Anyway, I got on the plane, and I felt as okay as someone who’s terrified of flying might feel. But I did find myself tapping my arm rest part way through the flight, and tapping is not something I’m usually prone to, so I wonder whether it did work in some way? Since then, I’ve continued to avoid flying. I’ve only been once to Amsterdam (with my son, who told everyone when we got home that I was so scared, he had to hold my hand…), and twice to Dublin. Each time, I feel a little worse, and I’m beginning to wonder whether I might soon turn into one of those people who demand to get off the plane mid-flight? I have a massive fear of flying. Some people think this is a silly thing, given that I get into my car and drive it every day. I disagree, for lots of reasons, but mainly because I don’t fly my car over vast expanses of water. A few weeks ago, I thought a fun way to get over this fear would be to put an abstract into a conference on the other side of the world. Well, that wasn’t quite my thinking, but as it happens, I did put an abstract in for a conference on the other side of the world. I thought if it was accepted, I’d just have a little think about the flying thing when it became necessary. So now it’s become necessary, because the abstract was accepted for a poster presentation at this year’s Australian College of Midwives’ conference in October, which is happening at Gold Coast (you see that spectacular photo at the top of the page? Yes, it is). Initially, I thought I just wouldn’t be able to go – for fear and financial reasons. However, it turns out that my university has a staff travel prize, which includes poster presentations, so that would be a help. And then my eldest daughter pointed out that a lot of my friends would want me to go to Australia (apparently not in a bad way, though *hmmmm*), so I should raise the money to get out there.